Valentine's day Budapest - Happy Valentine! In Hungary people celebrate Valentin’s day and exchange gift to express their love, however this holiday is not so much commercialized here like in the U.S. It does not mean you won’t get romantic atmosphere, namely Budapest is fundamentally one of the most romantic cities in Europe even in the everydays, imagine how romantic it can be during Christmas time or Valentine’s Day. Valentine’s day does not mean there is only 1 day each year you have to show your love extremely, but can be a really good reason to strengthen your love if you focus on each other for a few days. So if we count VDAY as the first day, as a start of your romantic time of the year it should last at least for three days. It means you have plenty of option to enjoy the romantic atmosphere, share a breakfast, a dinner and minimum 1 whole day together with your love. So take your holiday, pack your things, grab your love and go direction Hungary to discover the romantic side of Budapest! To help you plan a great, romantic vacation, let's see an example of a 3days holiday you spend in Budapest with your other half. Where to go, what to eat, what to drink, what to visit? Staying with the magic number, we give you 14 ideas, what to do, what are the romantic programs in Budapest to enjoy your lovely holiday. But first of all Let’s be honest, VDay without romantic dinner just does not work, so a romantic dinner is a must. We would like to draw your attention to our Valentine’s Day dinner cruise, where you can enjoy a 4-course fine dinner while floating on the Danube and admire the view of Budapest while listening to a soft piano music in an absolutely adorable, romantic atmosphere. As you have dinner plans, here are some Valentine's Day Programs in Budapest, ideas how to tune for the romantic dinner, what to do during the day before the evening comes. 1. 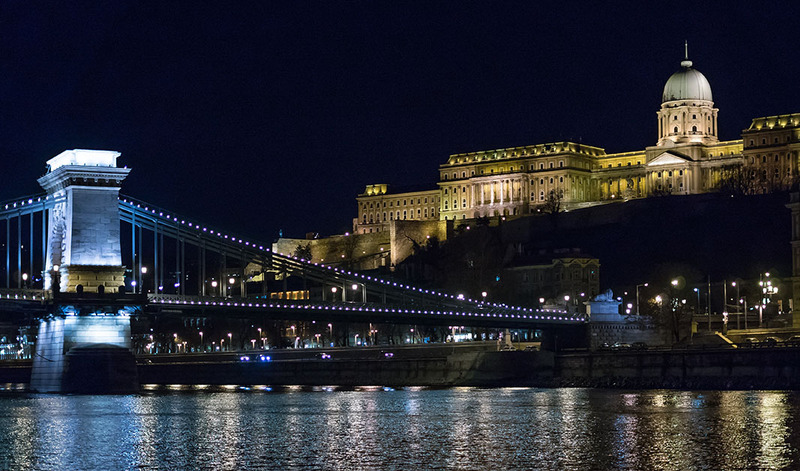 Start at Deák Square and walk to the Chain Bridge. This bridge was the first to link Buda and Pest and on the other side, you can take the Funicular up to the Castle. The Castle district and the Fisherman’s Bastion are really famous for romantic walks because of the breathtaking view. 2. Start at Deák Square again, have a nice walk on the Váci Street and on the Daube Promenád, where you can sit for a pre-dinner drink in a bar before you join us on our dinner cruise. 3. Visit the most famous Great Market Hall of Budapest, after that walk to Buda trough the Liberty Bridge and „climb” up to the viewpoint of the Gellért Hill. The perfect spot for watching the sunset. 4. Spend the day in Szécheny Bath and pamper yourself with the unique thermal water during the day, before you prepare for a romantic dinner cruise. The dinner is over, VDAY is officially over but you still want to enjoy your romantic holiday in Budapest, what should you do next? 5. Budapest is the capital of thermal water, so even you already tried Szécheny Bath on the day before, there are plenty of other spas built with different style on thermal springs, why not to try all of them? 6. Szentendre is a little pearl next to the Danube and it is only 22 km far away. It is almost a must to visit in Hungary, especially if you are interested in any kind of art. 7. The City Park Ice Rink is one of the most romantic spots of Budapest during winter time. Don’t forget to sip a mug of mulled wine. 8. In case you are in a discovering mode, CSOPA science center can be another target for you, since it is a museum of science explained in a creative way. 9. Budapest gives place to Europe’s largest ongoing interactive pinball exhibition. 10. When February, then Carnival, if Carnival, the doughnut is a must to eat. Visit the best places in Budapest and you can try as much as different taste you want. 11. Another interesting exhibition is the Invisible Exhibition where you can experience how does it feel if you lose your seeing and definitely teaches you to value your sensory organs and how you can help people who lost their sight. 12. The Zoo of Budapest is between the biggest Zoo’s in Europe and open during the whole year. 13. Are you a music lover? Are you interested in Hungarian Folklore? Visit the Budapest Operetta & Music Theatre and enjoy the show they offer. 14. You like Adventure and solving tasks? You can find high-quality escape room experiences in a different theme. Every year on 14th of February millions of people across the whole World of all ages show their love or affection for each other by sending cards, flowers, chocolates, messages, hugs or a dinner invitation. What is the real reason behind it? Why is this month associated with love and romance? Who is this Valentine and where is this celebration comes from? There are different ideas about where or how the celebration of Valentine's Day began, so let’s find out the answer for all the questions, learn with us about the story of Valentine and even the origin of Valentine’s Day. Have you ever had the question in your mind „who was this Valentine actually?” when sending a card or a gift in his name, or have you ever wondered from where is his tradition comes from, why exactly we celebrate this day as the day of love? So let’s start to dig deep inside the history to get to know better the origin of this celebration and be impressed by how complex the evolution of a holiday can be. Just like Halloween or for example Christmas, what was originally celebrated as an equinox. With the time this pagan celebration has been replaced by Christianity with the birthday of Jesus, and after that Santa Claus took even his place in a lot of countries -whose story comes from Turkey, as a charity priest-, and even the first Christmas tree was set in the year around 1510. Or the story of the Easter Bunny, where a Jewish holiday was replaced with the death of Jesus and meanwhile a folkloric easter rabbit brings eggs as the symbol of life. What chaos! By the way, have you never wondered how can a bunny bring painted eggs? Nevermind, let's turn back to the story of Valentine! So back again to Valentine, you asked who was Saint Valentine, do you? We ask back, which one? And as we see you are interested in his story, let’s go through on this history. But again, which version of it? Namely, there were several martyrs in the history named Valentine be recognized by the Catholic Church. According to the Catholic Encyclopedia, there were at least 3 different early Christian saint who were called Valentin or Valentinus and all of them were martyred. One of them was a priest in Rome, the other one was a bishop in Terni and about the third one we just know he died in Africa. And what a surprise, all the three of them have been martyred and all of them on the fourteenth of February. The Christian church honors the first of these men but still, there are two different version of ST. Valentine’s history, a Protestant and a Catholic one. There is a legend of one of them which tells the story, that Valentine was a priest in Rome, who served during the third century AD while Claudius II was the emperor of Rome. At that time the Roman empire faced many crisis and needed plenty of strong, good soldiers. Claudius II recognized that married men are emotionally attached to their family so he believed that marriage made them be weak and obviously single man makes better soldiers, so he decided to outlaw marriage for the young soldiers. But the kind-hearted bishop Valentine, seeing the trauma of young lovers decided to help them to get married with his help on a secret place. Sadly this action could not remain hidden for such a long time and when his secret had been discovered, Valentine has been arrested. While waiting in the jail Valentine became a friend or fall in love with the daughter of his jailor and when Claudius gave the order of his execution, Valentine asked for pen and paper to write a last, goodbye letter for the girl. He signed this farewell message with „From Your Valentine”, which became a phrase that lived ever after. Based on the other version Valentine may have been killed because of his important role of helping Christian people escaping from Roman prisons. In this story there was an imprisoned Valentine who actually has sent the „original valentine's greeting” to the jailor’s daughter after falling in love with her while sitting in the prison during the confinement. Before he had been executed he has sent the letter with the expression „From Your Valentine” which is still in use nowadays. It is believed, that he has been executed on the day 14th of February in 270 AD, which day became a day for the lovers already in the Roman empire and with the coming of Christianity it expanded all around the world and nowadays lovers look at Saint Valentine as their patron. And although we do not know the true truth behind the legend, the stories surrounding Valentin's personality are engaging and impressing and perhaps this is the reason why he became so popular already in the middle age and why is his popularity unbroken to these days. We already know- more or less-, who was St. Valentine, but there is still a question about how Valentine day became a worldwide famous holiday? February is the month of romance for a long time now and to be honest, when you think of Valentine’s Day you probably think of flowers, chocolates and pink cards sent with a kiss – but nothing else, don’t you? Valentine’s Day became a quiet commercial holiday with the time, but if we look back to the roots of the celebration, it turns out, that this candied holiday has bloody, pagan rituals - we do not want to share in details. For example, in the ancient Rome, there was the so-called Lupercalia (Festival of the wolf), the fertility festival that was dedicated to Faunus (Roman agricultural’s god) and celebrated at February 13-15. So as an ancient festival took place annually in the middle of February to purify Rome and to chase away bad spirits than to release health and fertility - can be considered as an inspiration for the future VDay. Than in the 5th century, Popa Gelasius I. made a Christian rebranding just like other pagan rituals Lupercalia has been replaced with a more soft version, when people spread love and do not sacrifice anything. Catholic church wanted people to completely forget about this celebration but it happened only a few centuries later, when Valentine became one of the most popular Saint in the Middle age. By the 18th century VDAY become common in England with the gift-giving, and commercially printed cards were being used. Nowadays VDAY is one of the major holiday around the world. Just like each holiday, Valentine’s Day has its traditions and unique roots we do not really know while focusing on showing our love. However it is always interesting to be aware of what is exactly we are celebrating and how other people on the other part of the world do it. Here is a list – of course, we collected 14 of them clinging to the number of love-, with a few interesting facts worldwide. 1. VDAY is the second most popular day after Christmas when it is about card-sending. 2. As a result of VDAY, the number of newborn babies increases in November. 3. As the most romantic day of the year, engagement and wedding days are on the 14th of February, causing the most common wedding anniversary day. 4. In March more at-home pregnancy tests are sold than in any other months of the year. 5. In Japan, only women buy Valentine chocolates and men don’t return this favor until White Day, what is a type of „answer” day to Valentine’s day in March. 6. Don’t be sad, if you are single and dispaired on this day, because you can celebrate SAD (Singles Awareness Day) with other similar people. 7. Considering the condom company Durex, around VDAY condom sales increase with 20-30%. 8. In Finland VDAY is called Ystävänpäivä, what means „Friend’s Day”, and is not really about our love, but everyone important for us, just like friends. 9. In 2000 on VDAY an Impotence Awareness Day has been founded by the producer of Viagra. 10. Every year at VDAY in Verona, Italy, where Shakesperae’s romantic lovers Romeo and Juliet lived, a huge number of letters arrive addressed to Juliet. 11. The daughter of Henry the IV of France, Madame Royale loved VDAY so much more, than other holidays, that she called her palaces after VDAY „The Valentine”. 12. About 3% of American pet owners will buy a gift for their dogs (pets) for VDAY based on retail statistics. 13. One of the famous symbols of VDAY, the ribbon is rooted in the Middle Ages, when knights’ sweathearts often gave them ribbons for good lucks while competed tournaments. 14. Another favorite symbol of Valentine cards, the dove has been chosen based on a mediavel beliefe that this bird choose their lifelong mates on February 14. Bytheway the dove was sacred to Venus, the goddess of love. Of course, there are always people who do not really like VDAY. Maybe someone broke their heart, don't like the flower-chocolate-card combination or just does not make much sense for them this celebration and of course, there could be countless reason why people are against this holiday. This does not mean, by the way, they do not want to celebrate at all, also there are some theories, what else could be celebrated instead of love on 14th of February. For example, another doctrine of the Anti-VDAY says, there cannot be only one day each year for love, also these people celebrate both 13th of February and 15th of February. And on this anty-VDAY „frame”, which is a symbolic sign of the festival Lupercalia from the ancient Roman empire they are focusing on physical love and sexuality. Maybe they are right, who said VDAY should be fun only for couples? Who said they cannot enjoy being single and spend the time alone, with friends or with the family? Are you one of the people who think the same? No worries, you are not alone with it, that is why there are Anti-Valentine’s Day events in each country’s capitals, just like in Budapest as well. Choose one of them and have a great single party, or choose one of the Valentine’s Day programs we mentioned above and share the fun with your friends. Home » Valentine’s day Budapest – Happy Valentine!